A tractor-trailer delivering three supercars to a dealership in Long Island crashed early this morning on a New York state parkway. The truck's contents? Two Porsche 911s and one rare Gumpert Apollo I was supposed to drive yesterday. According to the state police, the truck was traveling on the Wantagh State Parkway when it impacted an overpass between 2 and 3 A.M. The cars — you can see the orange Gumpert in the back — were being delivered by Evolution Motorsports of Tempe, Arizona, to Legend Autorama in Massapequa as part of an event called the Evolution Motorsports/Gumpert Racing Summer Tour. 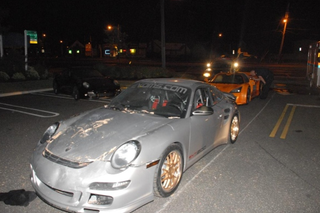 The Porsche shown here, a tuned 911 known as the 997.1EVT1200, incurred significant damage. A second 911 was also in the truck but got off with little more than a few scratches; the Gumpert was unharmed. No one was injured in the crash. In other news, I was scheduled to drive a dealer-owned Gumpert Apollo S last weekend at a track test but had to cancel due to unforeseen personal complications. I've since learned that the orange beast you see here was that car. Glad no one was hurt.